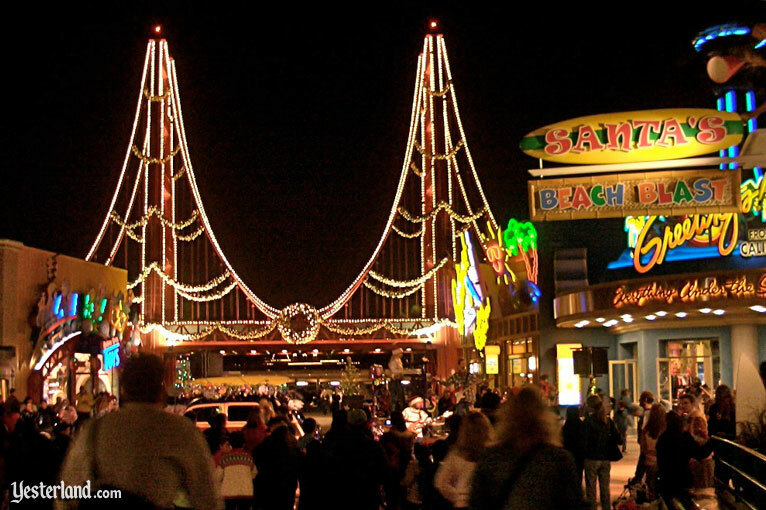 California is a great place to take a vacation, and Santa Claus knows it. 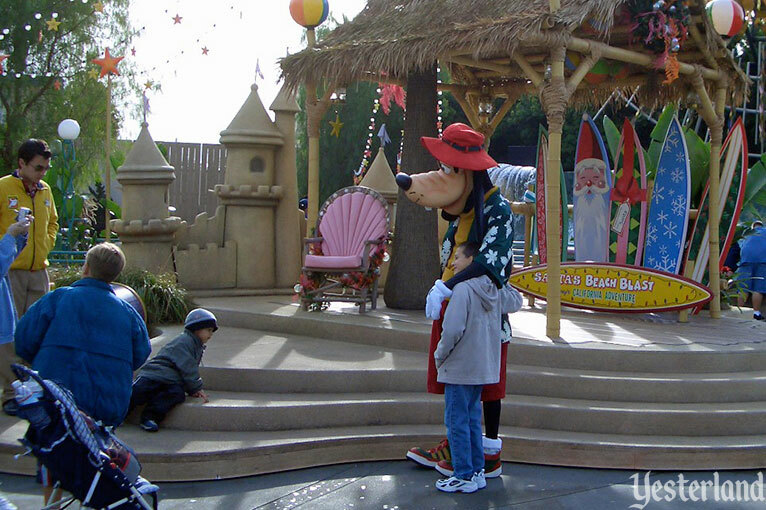 So this holiday season—when Santa Claus really should be working—he’s taking a vacation at Yester California Adventure park. He’s taken over part of Sunshine Plaza to bask in the glow of the golden California sun. You know how some celebrities like to hang out together? 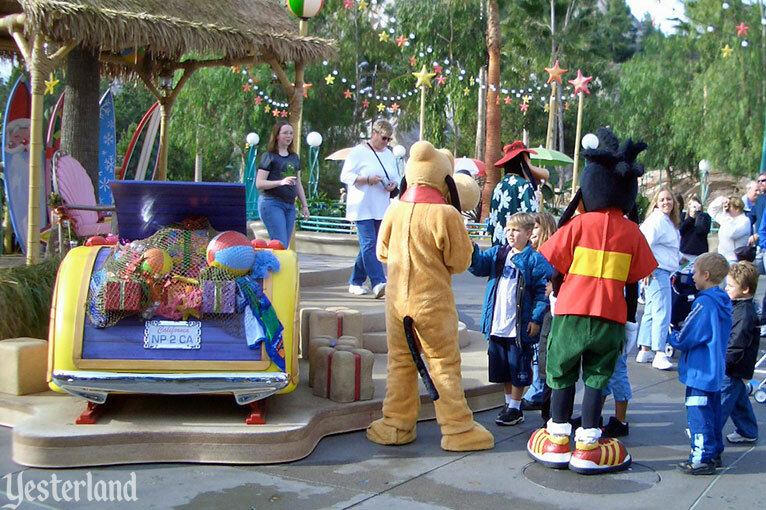 Mickey, Minnie, Pluto, Goofy, Goofy’s son Max, and other Disney characters have joined Santa’s vacation. 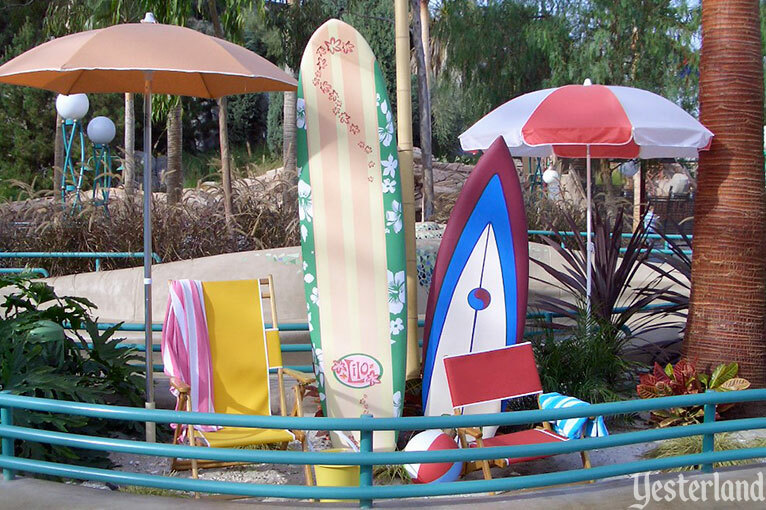 Santa’s Surf Shack is next to his sand castle. 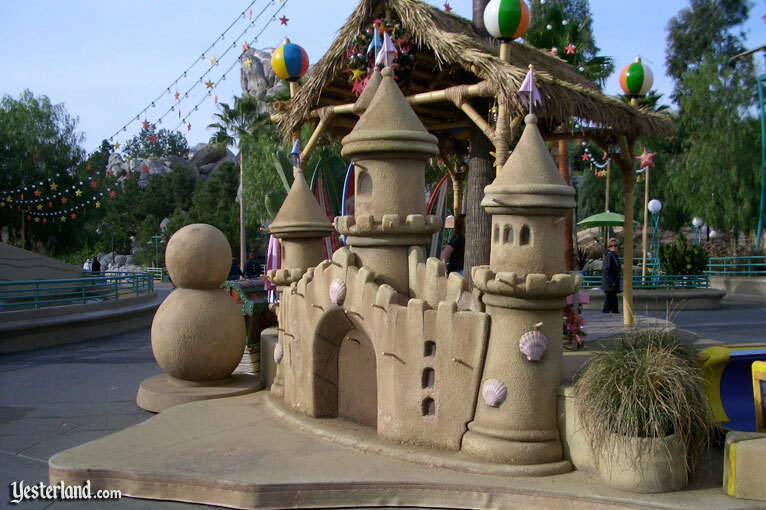 So now Yester California Adventure has its own castle—just like Disneyland (but not quite as big). You may have encountered Santa at a department store plopped in a big chair, just waiting for kids to sit on his lap. That’s not what Santa does here. 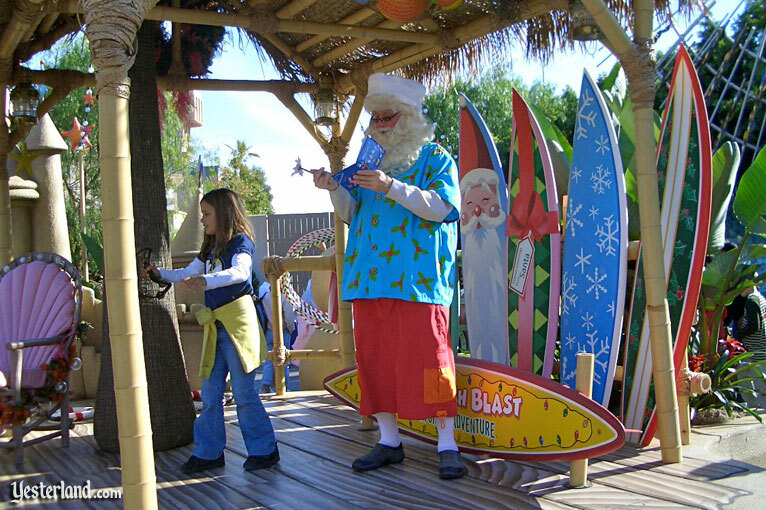 You’ll find Surfin’ Santa partying. 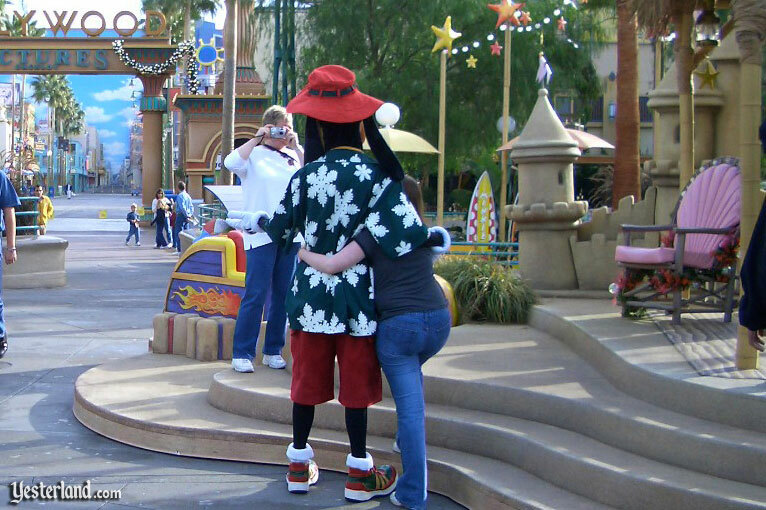 The Santa cap is always part of Santa’s look, even here at the “beach.” But Surfin’ Santa left his heavy red coat and trousers in the closet in favor of a colorful aloha shirt and baggy surf shorts. 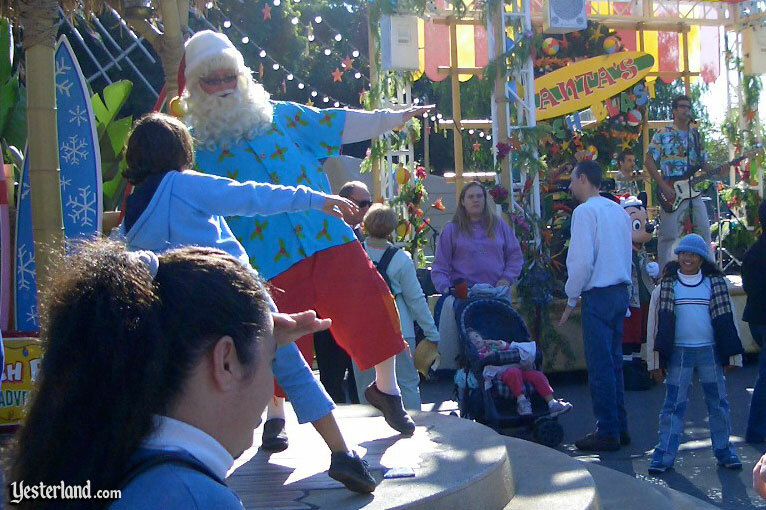 On colder days, Santa might be seen with long red sleeves under his aloha shirt, along with heavier pants. Bring your autograph book. 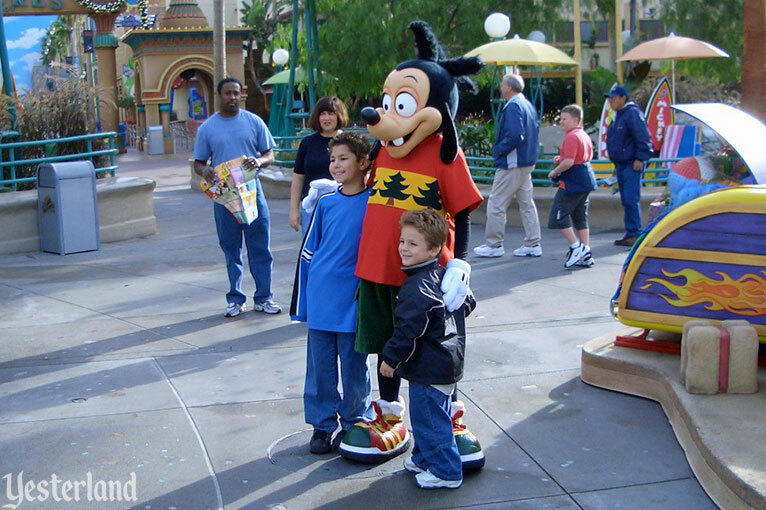 Not only can you get Santa’s signature, you can also collect autographs from numerous Disney characters. 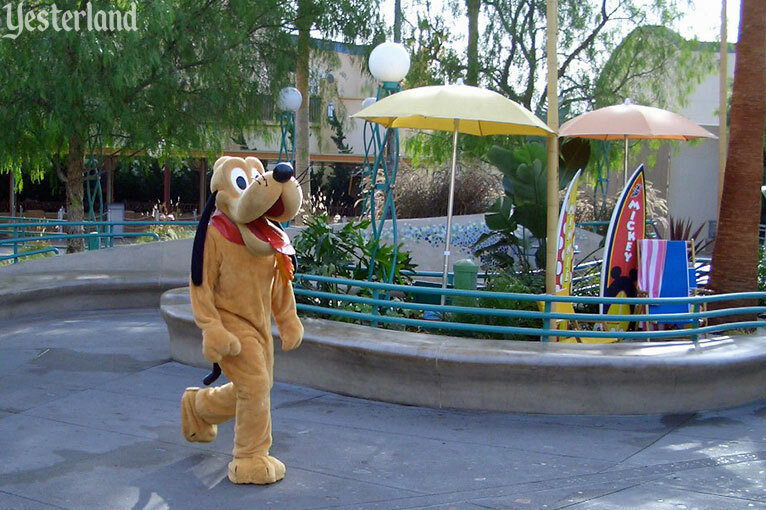 The Disney characters may be on vacation, but they never forget their fans. It wouldn’t be a party without music. 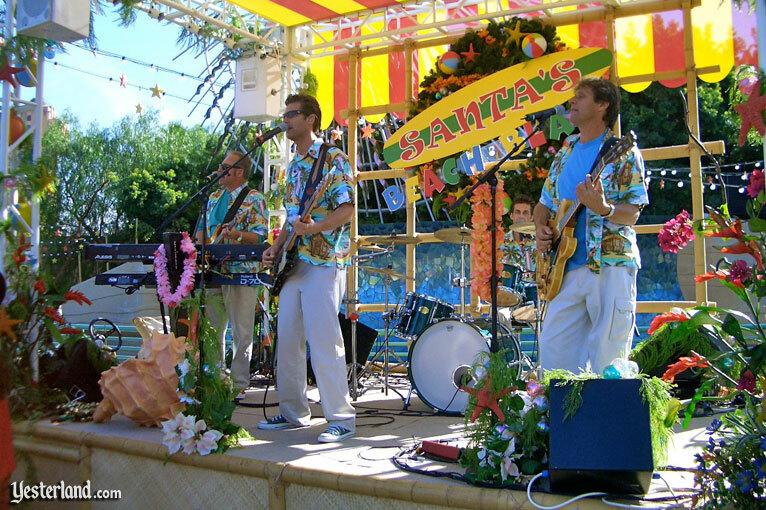 Listen to the Wave Riders beach band playing Beach Boys music. 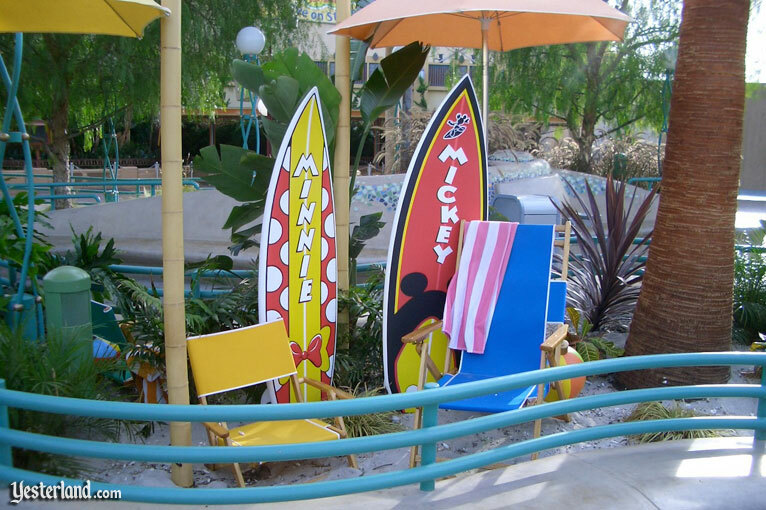 Borrow a Hula Hoop from a Cast Member, and keep it going in time with the Wave Riders’ music. Or just dance. Or just listen. 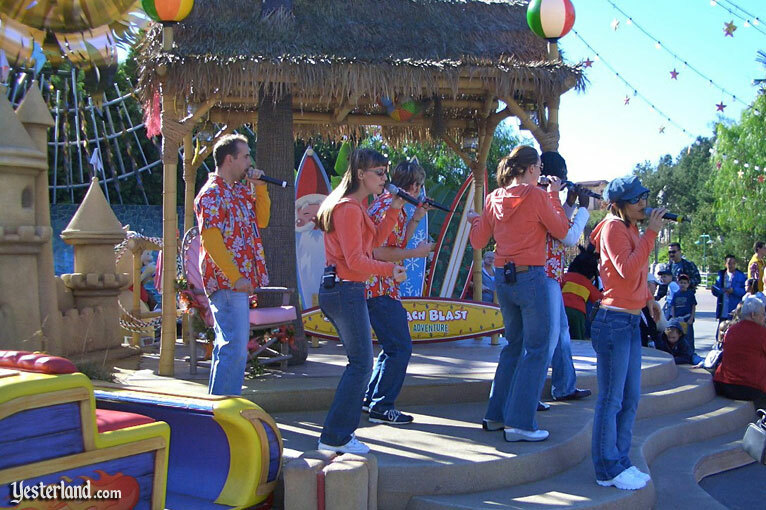 Groove 66, an a cappella group, sometimes performs on the steps of Santa’s Surf Shack. 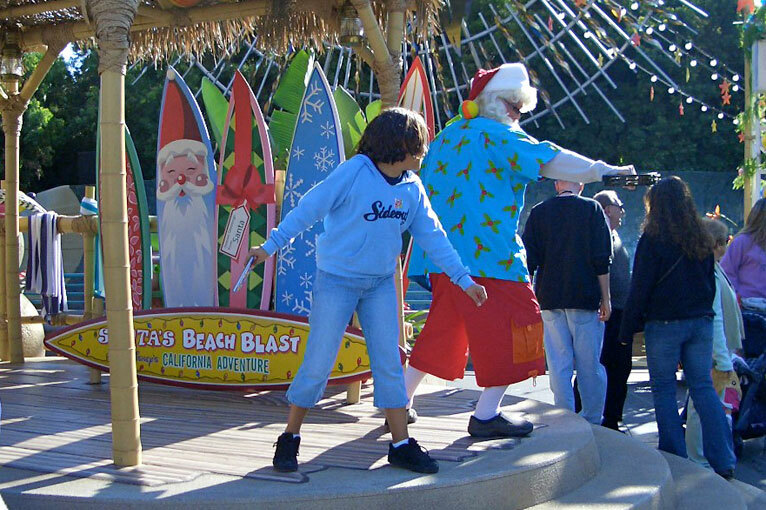 Say good night to Surfin’ Santa as you leave the park. 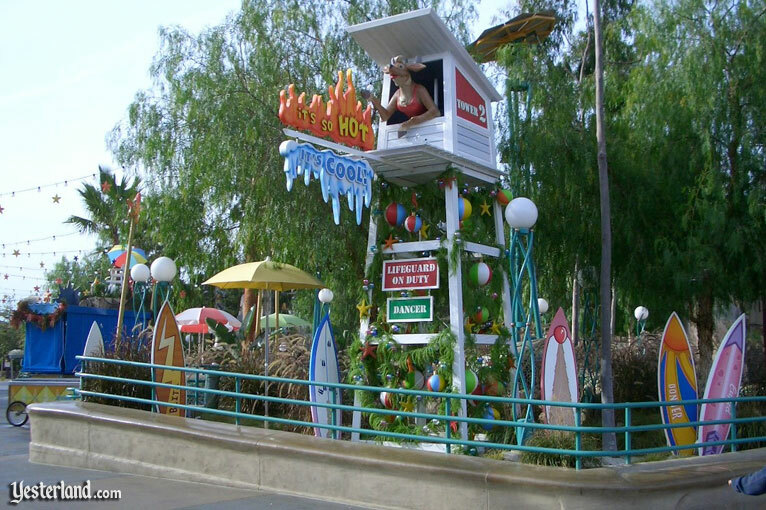 Santa’s Beach Blast goes until 8:00 p.m. (if the park is open that long). 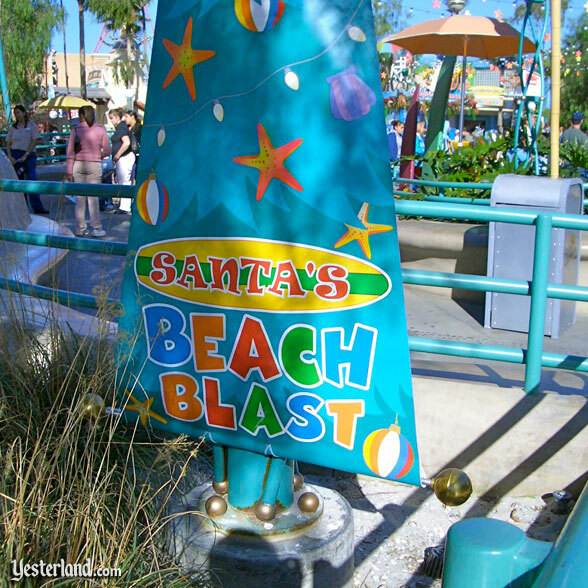 Santa’s Beach Blast was an entertainment offering at Disney’s California Adventure during the holiday seasons of 2003 through 2007. 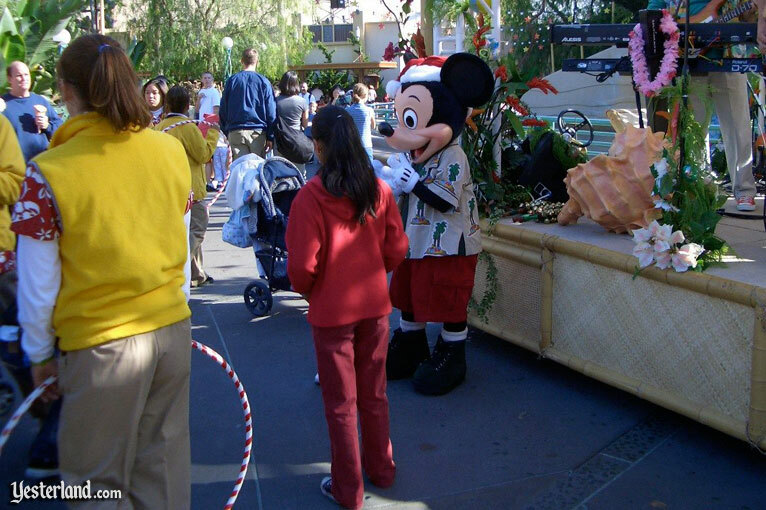 It was essentially a meet-and-greet and an effort to decorate Sunshine Plaza for the holidays in a nontraditional way. 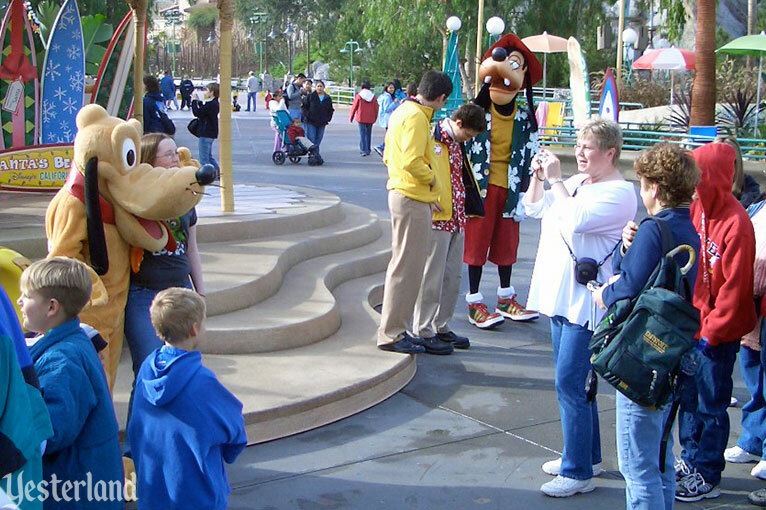 Five seasons was a long run, especially at a park that relies so heavily on repeat visits by Annual Passholders.